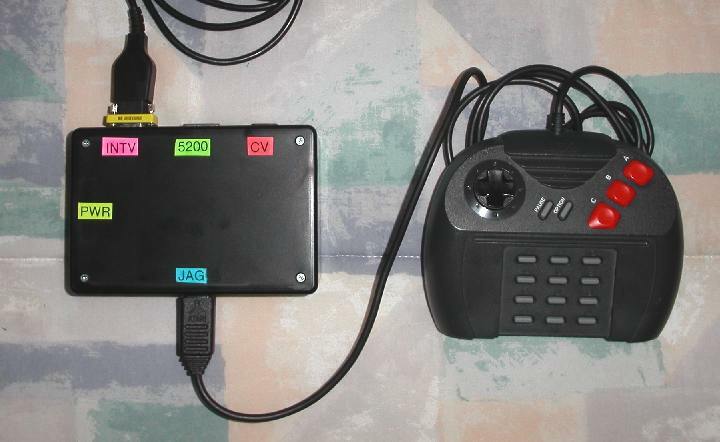 I've seen many posts over the years where people wished there was an adapter to play a 5200 or Intellivision, or Colecovision with a Jaguar controller (and why was it so hard for those companies to make a nice comfy keypad controller anyway?). Finally went and built one myself, and since all the hard work involved the Jag decoder, I combined all three adapters into one unit. If you decide to build this, there are some shortcuts that might help. As mentioned, if you build an adapter for just one system, you don't need to wire up the other two encoders. If you build just a 5200 adapter, you don't need external 5v or gnd connections, they're on the controller jack. Likewise, if you just build an intv adapter, you can replace the eight 74175 flip-flops with four 74174 ones (don't need inverting outputs). Finally if you build the adapter into the console, you won't need a cable or project box. The 4060 is a binary counter that can be wired up to oscillate. The RC values used make the three outputs shown have square wave frequencies of 140, 70, and 35 hz, each one is exactly 1/2 the frequency of the next. The 70 and 35 hz signals are hooked up to a 4052 2 channel analog mux. This makes the two mux outputs continously cycle through its four selections. On channel 2, the four Jaguar pins (1,2,3,4) are pulled low one at a time, just like a jag console does. This causes the controller data to appear on Jag pins 6,10,11,12,13, and 14, which are connected to the inputs of the four sets of D flip-flops. The first mux channel is used to connect up the 140hz signal to the clock inputs of one flip-flop set at a time. In the middle of each of the four mux states the 140hz signal produces a rising edge (how convenient!). So whatever data is on the six jag pins mentioned gets latched in until it's updated on the next cycle through. To summarize, each jaguar controller button (including the dpad directions) gets decoded and stored in a flip-flop as a steady state value. 2. If you swap some clock lines, don't worry about it because the circuit is very symmetric. Just make a note of where every flip-flop signal comes out at, and wire up the pause signal after you find where the Fire_button_A signal is making its grand appearance. 3. You can wire this circuit many different ways and still have it work. For example one flip-flop could carry three signals, the other two, instead of doing four and one. 4. One thing that helped me was lining up flip-flops vertically on the board. One bare metal wire then connected up all the VCC and /RST connections. You can also make the D inputs leapfrog from chip to chip. 5. The 4016 analog switch outputs are bidirectional, so if one signal is on all four outputs, you can run a bare wire between pins 2,3,9,and 10 to easily solder them up. 6. I'd recommend choosing either an LS or HC logic family for the ICs. My colecovision supply was only putting out 4.5v on the 5v line and I needed to use LS175 flops, because the wimpy HC175 ones from ST wouldn't work. You probably won't have this issue. 14-bit asynchronous binary counter with oscillator and reset input. Q0,Q1,Q2 and Q10 outputs are missing. 8-to-2 line analog multiplexer/demultiplexer with dual power supply.